continue to deprive Native Americans of their cultural legacy today. This article first appeared on my old website, Lost Civilizations Uncovered, in 2002. The early history of Mesoamerican studies is characterized by a grave dispute over the origins of Mesoamerican civilization. In many ways, this dispute is an argument over two lost continents, Atlantis and Mu, and where their survivors may have settled. Proponents of the Atlantis hypothesis argued that survivors of that lost continent spread to Africa and to Central America, giving rise to advanced civilizations like Egypt and the Maya (Orser 2001), while followers of Mu claimed that refugees from the lost Pacific continent ventured to China and Central America, giving rise to advanced civilizations (Tompkins 1976). That Mesoamerican civilization began in situ is never contemplated. The two leading advocates of their respective theories were Ignatius Donnelly and Col. James Churchward. According to Prof. Charles Orser (2001) Donnelly, a former vice-presidential candidate, built upon the myth of Atlantis laid down by Plato and created a vision of the island-continent that would last for a century after his book, Atlantis: The Antediluvian World ceased to be remembered: "It is, quite simply, the most significant pseudo-archaeology book ever written, and it has provided a roadmap for the flood of pseudo-archaeology that has come after it." On the other end of the spectrum, Col. Churchward believed in an island civilization located in the Pacific Ocean, whose remains he believed can still be seen in the cyclopean ruins of the Polynesian islands, most notably the statues of Easter Island. Alternative historian Peter Tompkins (1976:364) says that Churchward's Mu was the origin of civilization with "one branch of colonization [which] ran from Mu to Central America, thence to Atlantis." In this scheme, civilization arrived in ancient Mesoamerica by a Pacific route, and Atlantis is downgraded to a colony of the greater Mu. The conflict among these pre-modern diffusionist theories would lead generations of diffusionists to claim external origins for Mesoamerican civilization, much to the dismay of archaeologists, who tried to stop the robbing of indigenous cultures (see Haslip-Viera et al. 1997). Donnelly placed Atlantis in the Atlantic Ocean and had its descendants populate the Atlantic rim, bringing culture to the ignorant natives after the fall of the great island. This theory was eagerly adopted among the diffusionists of the nineteenth century because, as Tompkins (1976:36) recounts, "the similarity between Mexican and Egyptian pyramids, hieroglyphs, and calendars was too strongly indicative of the existence in the Atlantic of an intervening continent or group of islands, for which Plato's account of Atlantis fit the bill." Of course, having the side-effect of denying the native peoples a culture on par with that of the Europeans did nothing to retard the spread of diffusionism. After the twentieth century rejection of the Atlantis hypothesis, speculation transformed the Atlantis hypothesis into transoceanic contact. However, even under this scenario, the connection is tenuous at best. The Egyptian and Mesoamerican pyramids bear no relation to each other in either form or function. As Haslip-Viera, Montellano and Barbour (1997:427) point out, the Mexican pyramids were step-pyramids with wide, accessible stairs topped with temples while the Egyptian were regular pyramids with no access or temple-top. Furthermore, if the Egyptians did come to the New World, why should they have taught the Olmec of 1500 BC the pyramid-building techniques they themselves had stopped using hundreds of years earlier? The same year that Tompkins wrote his alternative history of Mexican pyramid investigation, another researcher was using the old nineteenth century theories to formulate a different view of the origins of ancient Mexican civilization. As Gabriel Haslip-Viera, Bernard Ortiz de Montellano and Warren Barbour (1997) discuss, Ivan van Sertima proposed that ancient Mesoamerica derived its civilization from transatlantic voyages by Africans. Van Sertima was on the forefront of the Afrocentric movement, and firmly believed that African (black) people were responsible for all of the ancient civilizations of earth: "In the case of the Americas, a more complicated scenario had to be advanced in order to account for the relative isolation of these continents and the geographic obstacles posed by the Atlantic and Pacific" (Haslip-Viera et al. 1997:420). Van Sertima laid out a complex scenario of transatlantic voyages that relied upon two basic pieces of evidence: African plants in the New World, and African faces carved in ancient Olmec stones. The botanical evidence may be disposed of in a few sentences, but the stone heads will take a longer, more circuitous route to understand. The botanical evidence for transoceanic contact basically boils down to the African bottle-gourd, which, Michael Coe (2001b:34) points out, was the first domesticate of Mesoamerican peoples, cultivated around 6500 BC. Van Sertima had argued that African voyagers brought the plant to the New World, the oldest African bottle gourds cultivated in the Old World date only to 3000 BC: "Thus gourds were first cultivated in the New World much earlier than in Egypt [Haslip-Viera et al. 1997:429]." For knowledge of gourd cultivation to travel from Africa to Mexico, it would be necessary for the Africans to have been growing the gourd before the Mexicans, to whom they supposedly gave it. Furthermore, since the gourd is capable of traveling across the ocean unharmed, Haslip-Viera, Montellano and Barbour (1997:429) argue that "there is no need to posit human transport to the New World" because there is no other evidence of introduced African species before Columbus. On the other hand, the evidence for Africans immortalized in ancient Mexican stonework requires deeper and more complex treatment. Jacques Soustelle (1985: 10, 14) reports that the Olmec culture first became known in 1862 with the discovery of the first colossal stone head, but the culture was not identified as something apart from the Maya until 1926. Thus, the first report of an Olmec head was tinged not just with the racial attitudes of the day but also with a complete void in the archaeological understanding of the region. When nineteenth-century traveler José María Melgar y Serrano ventured deep into the Mexican jungle to investigate rumors of colossal stone statuary hidden amidst the verdant green forests, he had no way of knowing that he would set off more than a century of speculation into the transcontinental origins of Mesoamerican civilization. For Melgar y Serrano had discovered the first signs of the oldest high civilization in the Americas, the Olmec, and he was shocked by one of their colossal stone heads which seemed to him to bear an uncanny resemblance to African peoples: "As a work of art, it is, without exaggeration, a magnificent sculpture... but what most amazed me was that the type it represents is Ethiopian. I concluded that there had doubtless been blacks in this region, and from the very earliest stages of the world [Soustelle 1985:9]." Over the course of the next hundred and forty years, scores of authors would write about the African appearance of the Olmec and hold up these colossal stone heads as proof that voyagers from Africa had given the Olmec the boon of civilization. In 1995, alternative historian Graham Hancock released his massive tome, Fingerprints of the Gods, in which he expanded on the old diffusionist theories for the origin of the Olmec. 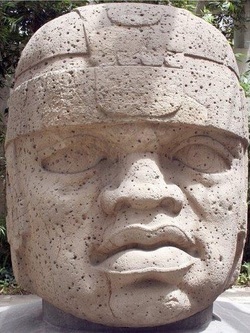 In claiming that the Olmec heads were of African origin, Hancock (1995: 131) argued that "It would probably be impossible . . . for a sculptor to invent the different combined characteristics of an authentic racial type. The portrayal of an authentic combination of racial characteristics therefore implied strongly that a human model had been used." These traits referred to were apparently the broad noses and thick lips of the Olmec heads, which van Sertima, Hancock and others link to Africans. However, as any biological anthropologist could demonstrate, phenotypes have virtually nothing to do with race. As Jurmain, Nelson, Kilgore and Trevathan (1998:108) note, race is not a biological concept: "the amount of genetic variation accounted for by differences between groups is vastly exceeded by the variation that exists within groups." As a result, "race is a meaningless concept [Jurmain et al. 1998:108]." So having thus established that there are no races to be depicted on the Olmec heads, next it must be shown that the heads do not share the same characteristics with their supposed models. Haslip-Viera, Montellano and Barbour (1997:423) spend a considerable amount of space discussing the evolutionary history of flat noses and wide lips as adaptations to the Mexican tropical climate. The old argument that Egyptians gave civilization to the Olmec is untenable by these heads because "Nubians and Egyptians have longer, thinner noses because they have lived in a desert" (Haslip-Viera et al. 1997: 423). That the heads were of West African (stereotypically black) origin is also refuted by noting that West Africans are prognathic (jutting jawed), while the Olmec heads are markedly not. Also, the Olmec heads have epicanthic eye-folds like Asians, while African populations do not. In other words, the Olmec heads show Mexican people: "they resembled people who still live in the tropical lowlands of Mexico" (Haslip-Viera et al. 1997:423). The African-origins hypothesis seemed initially to accord well with the hyperdiffusionist movement of the late nineteenth century. It was then assumed that civilization began in Egypt and spread from there to all corners of the world, and that the peoples of the Americas had to have received their civilization from outside sources because of their biological inferiority (Haslip-Viera et al. 1997:420). Of course, the late nineteenth century thinkers were troubled by the seemingly African features of the Olmec sculptures, since the Egyptians, whose civilization was the antecedent of all, were believed then to be Caucasian people. The so-called Negroid type was thought to be biologically inferior, as well. The genius of van Sertima's hypothesis was that it made the African phenotype the biologically superior one, and thus "established" that the old views were correct, but in the wrong color: "It is curious that this hypothesis has resurfaced in the late 20th century in revised form, with the biologically superior people now being identified as blacks" (Haslip-Viera et al. 1997:420). The African origins hypothesis has been refuted successfully on purely scientific grounds. Nevertheless, the manifold theories of African origins, in the words of Jacques Sostelle (1985:10), "continue to haunt Mexican archaeology like unsuccessfully exorcised ghosts." If the Africa-origins thinkers traced the beginning of their theory to the fiery demise of Atlantis, so do the Asian-origins speculators find their own lost continent had a hand in shaping the rise of Mesoamerican civilization. Writing after the demise of Donnelly's Atlantis theories, Col. James Churchward declared in 1930 the fabulous land of Mu was a Pacific continent greater than Atlantis, and that Central America was but a colony of this great land. While Tompkins (1976:372) believes that the Mu myth could explain the origins of Mesoamerican civilization, Churward's "word can only be taken by those who wish to believe him." Without evidence to back up his claims, Churchward's theory of a lost continent fell to the dustbin of history, though the idea of trans-Pacific voyages did not. Michael Coe (2001a:57) mentions that "the possibility of some trans-Pacific influence on Mesoamerican cultures cannot, however, be so easily dismissed." The Asian-influence hypothesis has a stronger basis in fact than its African competitor, though there is still precious little to go on. The strongest, and indeed only hard piece of evidence for trans-Pacific contact is the use of a particular technique for the manufacture of bark paper, common to China, Southeast Asia, Indonesia and Mesoamerica. Coe (2001a:58) says that knowledge of this paper-making method "was diffused from eastern Indonesia to Mesoamerica at a very early date." He further argues that since bark paper was used to make books, information may have been exchanged between Pacific and Mesoamerican peoples. This seems to accord with Tompkin's (1976:353) version of ancient Chinese records, which he claims document a transoceanic voyage between China and Mesoamerica in the fifth century A.D. Yet even if true, this would provide no evidence for Asian influence, since Olmec civilization sprang into being around 1500 B.C. (Soustelle 1985:31) and Maya civilization was well into its Classic Period greatness centuries before the supposed voyage (Coe 2001b: 82). However, Tompkins (1976:353) claimed earlier connection between China and Mesoamerica around the twenty-third century B.C. He was forced to concede, however, that since "there are no known historical records for such early periods... these stories float in a limbo between fact and fiction [Tompkins 1976:354]." Another attempt to relate Mesoamerican cosmology to the Chinese involved the calendar system. Coe states (2001a:57) that the 260-day Mesoamerican calendar cycle, with its animal symbolism, is a near-perfect analog to the Southeast Asian lunar calendar: "Furthermore, Asian and Mesoamerican cosmological systems, which emphasize a quadripartite universe of four cardinal points associated with specific colors, plants, animals, and even gods, are amazingly similar [Coe 2001a:57]." Balaji Mundkur (1978:541) challenged this idea decades ago, arguing that the comparison was faulty: "These comparisons seem feeble not only because they are superficial and intrinsically contradictory, but also because they are opposed by a vast body of [Asian] religious symbolism. Furthermore, they are chronologically incompatible with historical events." For Mundkur (1978:542), the differences between Asian and Mesoamerican art far outweigh the superficial resemblances, and art analysis can only provide a subjective connection between the Old and New Worlds, especially since so much of the Asian culture supposedly borrowed by Mesoamericans actually arose hundreds of years after the rise of the Maya and Mexican civilizations. But the superficial similarity in artistic styles has given rise to another line of argument. Among the most common arguments for trans-Pacific contact with Mesoamerica is a shared cult of the serpent, based on the presumed similarity of Chinese, Hindu and Mayan depictions. Both Asia and Mesoamerica dedicated shrines to serpents, and the cult of the serpent is seen in the most ancient civilized sites of Mesoamerica, including the Olmec occupation of Chalcatzingo (Coe 2001b:77) and La Venta (Hancock 1995:131f) as well as in ancient China and India (Mundkur 1976:429). However, the similarities appear to stop there. Mundkur (1976:429) successfully casts doubt on diffusionist claims when he notes that "the characteristics of the serpent cult in pre-Columbian civilized Mesoamerica... differ fundamentally from the serpent lore of India and Southeast Asia." Further, he notes that serpent worship is common not just to Asia and America but to nearly every known ancient culture and survived hunter-gatherers, from North America to Australia (Mundkur 1976:429). Something so universal cannot be taken to indicate common origin in historical times, though could conceivably point still further back to the Jungian archetypes that Victor Mansfield (1981) identified in the Mesoamerican pecked circles. Both Asia and America seemed to share a penchant for making mandalas, the drawn or carved circles of divine meditation favored by Hindus and Buddhists. Victor Mansfield (1981:274) says that the Mesoamerican mandalas were of Teotihuacan origin and shared a similar shape and placement in temples to their Asian counterparts. He offers an explanation for the superficial similarity of Mesoamerican "pecked circles" to Asian mandalas: "the pecked circles may serve as calendars [1981:274]" because they have a cross within the circle whose arms tend to point to the direction of solstices and equinoxes. While Mansfield (1981: 274-275) goes on to offer an Jungian interpretation of the way universal psychic forces influenced mandala (and Christian labyrinth) designs, the calendar representation is the most likely, especially when one remembers that the Mesoamericans envisioned the universe in four parts, thus the cross divides the pecked circle into four sections. Of course, to the Asian-origin hypothesis's credit, Asian (especially Chinese) cosmology emphasized a quadripartite universe. Yet, despite the stories and rumors surrounding Asian influence in Central America, there is very little hard evidence beyond the bark paper manufacturing technique. Coe (2001a:57) makes the point more succinctly: "[I]t should be categorically emphasized that no objects manufactured in the Old World have been identified in any Maya site." However, Coe (2001a:58) did agree that the Maya may have received Asian ideas "at a few times in their early history," though in no sense are they "derivative from Old World prototypes." Thus far we have examined hypotheses that, while routed in old ideas of lost continents, dealt specifically with trans-oceanic origins for Mesoamerican civilization in an attempt to prove an Old World origin for New World civilization. The logical extension of this line of diffusionist thinking was a return to the nineteenth-century vision of a lost motherland for human civilization, this time with a space-age twist. Swiss author Erich von Däniken (1969:viii) caused a sensation when he claimed "that our forefathers received visits from the universe in the remote past." Part obfuscation and part wild speculation, Däniken (1969:104) claimed that the Mesoamerican Feathered Serpent deity was a space alien because in his world, space aliens flew across the sky in rocket-ships, and these rockets seemed like snakes to the ancient Maya, who were presumably too stupid to understand much of anything: "How could anyone worship this repulsive creature as a god, and why could it fly as well? 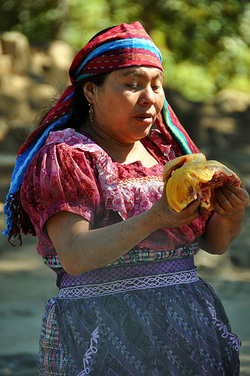 Among the Maya it could" (von Däniken 1969:104). Therefore, the Feathered Serpent must have been a rocket ship. 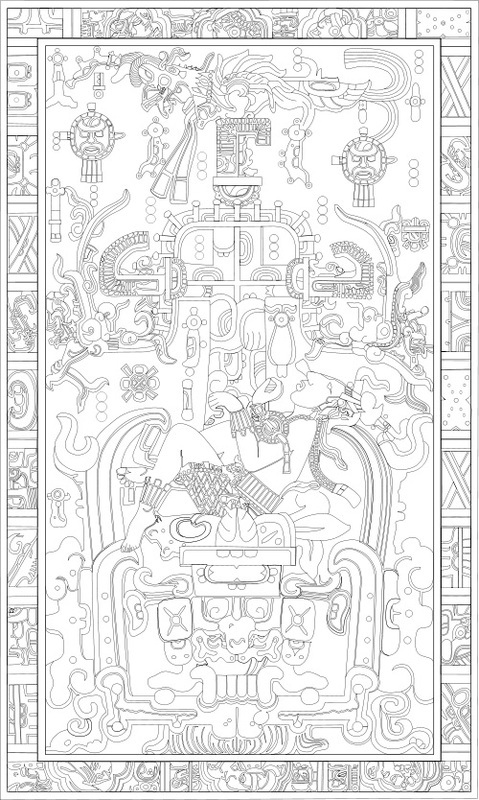 For von Däniken, the famed sarcophagus lid of Lord Pacal of Palenque shows not the "gigantic fleshless jaws ... the World Tree [and] the bird-monster Wuqub' Kaqix" (Coe: 2001a:137) but machinery: "today any child would identify his vehicle as a rocket" (von Däniken 1969:100). Almost thirty years later, Hancock (1995:151) argued after this line of reasoning that the tomb of Pacal "resembled a technological device much more strongly than it did... the king falling back into the fleshless jaws of the earth-monster." Only for Hancock, the agent responsible for this technology was not extraterrestrials, but "an older and a higher civilization [Hancock 1995:155]," not unlike the legendary Atlantis or Mu, long ago dismissed as improbable and unsupported by evidence. Thus the circle that began a century ago with Donnelly and then Churchward closes with more of the same. Despite criticism from the scientific establishment, including famed scientist Carl Sagan, the ancient astronaut and lost civilization hypothesis remains popular. According to Omni (1994:77) "One of Sagan's original objections was the underlying assumption that our ancestors were apparently too stupid to create the monumental architecture of our past." And indeed, this is the theme that cuts across all the diffusionist ideas about the origins of Mesoamerican civilization. Each of these authors argues that the Mesoamericans were incapable of creating a unique, vital and exciting civilization on their own, and that they needed outside agents to help them overcome their mental handicaps. This view is not only wrong, it is also racist. It is racist whether it comes from supporters of the Caucasian refugees of a lost continent (see Hancock 1995:102-104) or the Afrocentrists who see Africans as the superior race (see Haslip-Viera et al. 1997:420). What these belief systems fail to understand is that humanity has no biological determinism, that intelligence and the ability to create and to understand are not characteristics belonging to races, but individuals (Jurmain et al. 1998:109). Mesoamericans had a long tradition of civilization and culture before the Spanish conquest, and no attempt to rewrite history can deny the ancient peoples of Mexico their cultural heritage. Coe, M. D. 2001 The Maya. Sixth Edition. Reprinted. Thames & Hudson, Singapore. Originally published 1994. Coe, M. D. 2001 Mexico: From the Olmec to the Aztecs. Fourth Edition. Reprinted. Thames & Hudson, Singapore. Originally published 1994. Däniken, E. von. 1969 Chariots of the Gods? Bantam, New York. Hancock, G. 1995 Fingerprints of the Gods. Crown, New York. Haslip-Viera, G., B. Ortiz de Montellano, and W. Barbour. 1997 CA Forum on Anthropology in Public: Robbing Native American Cultures: Van Sertimas Afrocentricity and the Olmec. Current Anthropology. 38: 419-441. Huyghe, P. 1994 UFO Update: The Rise, Fall and Afterlife of Erich von Däniken's Theory of Extraterrestrial Gods. Omni. May: 77. Jurmain, R., H. Nelson, L. Kilgore, W. Trevathan. 1998 Essentials of Physical Anthropology. Third Edition. West/Wadsworth, Belmont California. Mansfield, V. 1981 Mandalas and Mesoamerican Pecked Circles. Current Anthropology. 22: 269-284. Mundkur, B. 1976 The Cult of the Serpent in Mesoamerica: Its Asian Background. Current Anthropology. 17: 429-455. --------. 1978 The Alleged Diffusion of Hindu Divine Symbols into Pre-Columbian Mesoamerica: a Critique. Current Anthropology. 19: 541-583. Soustelle, J. 1985. The Olmecs: The Oldest Civilization in Mexico. Translated by H. R. Lane. University of Oklahoma Press, Norman, Oklahoma. Tompkins, P. 1976 Mysteries of the Mexican Pyramids. Harper & Row, New York.